The rhizosheath-root system is an adaptive trait of sandy-desert speargrasses in response to unfavourable moisture and nutritional conditions. Under the deserts’ polyextreme conditions, plants interact with edaphic microorganisms that positively affect their fitness and resistance. However, the trophic simplicity and environmental harshness of desert ecosystems have previously been shown to strongly influence soil microbial community assembly. We hypothesize that sand-driven ecological filtering constrains the microbial recruitment processes in the speargrass rhizosheath-root niche, prevailing over the plant-induced selection. Bacterial and fungal communities from the rhizosheath-root compartments (endosphere root tissues, rhizosheath and rhizosphere) of three Namib Desert speargrass species (Stipagrostis sabulicola, S. seelyae and Cladoraphis spinosa) along with bulk sand have been studied to test our hypothesis. To minimize the variability determined by edaphic and climatic factors, plants living in a single dune were studied. 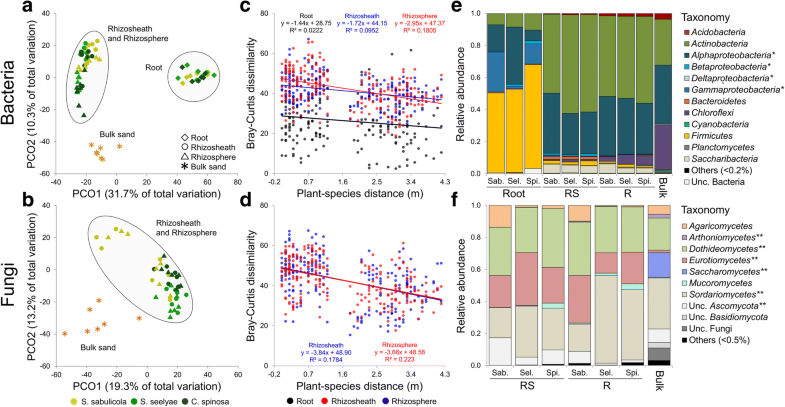 We assessed the role of plant species vs the sandy substrate on the recruitment and selection, phylogenetic diversity and co-occurrence microbial networks of the rhizosheath-root system microbial communities. Microorganisms associated with the speargrass rhizosheath-root system were recruited from the surrounding bulk sand population and were significantly enriched in the rhizosheath compartments (105 and 104 of bacterial 16S rRNA and fungal ITS copies per gram of sand to up to 108 and 107 copies per gram, respectively). Furthermore, each rhizosheath-root system compartment hosted a specific microbial community demonstrating strong niche-partitioning. The rhizosheath-root systems of the three speargrass species studied were dominated by desert-adapted Actinobacteria and Alphaproteobacteria (e.g. Lechevalieria, Streptomyces and Microvirga) as well as saprophytic Ascomycota fungi (e.g. Curvularia, Aspergillus and Thielavia). Our results clearly showed a random phylogenetic turnover of rhizosheath-root system associated microbial communities, independent of the plant species, where stochastic factors drive neutral assembly. Co-occurrence network analyses also indicated that the bacterial and fungal community members of the rhizosheath-root systems established a higher number of interactions than those in the barren bulk sand, suggesting that the former are more stable and functional than the latter. Our study demonstrates that the rhizosheath-root system microbial communities of desert dune speargrasses are stochastically assembled and host-independent. This finding supports the concept that the selection determined by the desert sand prevails over that imposed by the genotype of the different plant species. Deserts are dynamic and heterogeneous habitats that cover approximately one third of the global land surface . Besides aridity, hot deserts impose additional stresses to their indigenous flora and fauna, including oligotrophy, elevated daily temperatures and sun irradiation, high salinity, strong wind erosion and environmental physical instability [1, 2]. Consequently, deserts are characterized by a lower biodiversity than other productive ecosystems [3–6] with specific ecological niches occupied by adapted macro- and micro-organisms [7, 8]. Specialized desert plants (xerophyte species) have notably evolved both their aerial (stem and leaf) and subterranean (root system) organs to prevent water loss, improve water storage and optimize water and nutrient uptake [9, 10]. Desert speargrass species (of the Poaceae and Haemodoraceae families) grow in sandy/rocky desert soils and have developed a ‘rhizosheath-root system’ as a xerophytic adaptive-trait [9, 11]. The rhizosheath is defined as the portion of soil that physically adheres to the root system and which can encase the entire root system of certain plants [9, 12]. As the rhizosphere, it is strongly influenced by root rhizodeposition. However, the rhizosphere can extend beyond the boundaries of the rhizosheath as it is not necessarily physically attached to the root system . Root hairs, fungal hyphae and adhesive agents, such as microbial- and plant-derived mucilage, are responsible for the aggregation of the sand particles in the rhizosheath system [12–14]. The overall beneficial effect of developing a rhizosheath-root system has been demonstrated by the observation of a positive correlation between rhizosheath mass and plant growth under salt-stressed conditions . In deserts, rhizosheaths have been also shown to provide mechanical protection to the root tissues, to promote water conservation and uptake under drought conditions and to positively influence nutrient uptake [11, 16]. Moreover, rhizosheaths represents a refuge and a resource for macro-organisms, as they can feed on the plant and live in relatively stable environmental conditions comparing to the fluctuating bulk desert sand habitats . The rhizosheath structure provides also an ecological niche with favourable micro-climatic conditions, in which the higher water availability favours microbial growth and development, particularly of nitrogen-fixing bacteria [17, 18]. Despite the ecological services and protective advantages exerted by plant-associated microorganisms in deserts [3, 5, 19–23], few microbial cultivation-based studies have been conducted on the desert speargrass rhizosheath-root system [17, 18, 24, 25]. Such studies are also limited to a minor portion (the ~ 1% cultivable component) of microbial biodiversity and by their geographic range (mainly the Sinai desert) and the plant diversity (Panicum turgidum, Stipagrostis scoparia, Bromus spp., Trisetaria koelerioides and Cyperus spp., [17, 24, 25]. 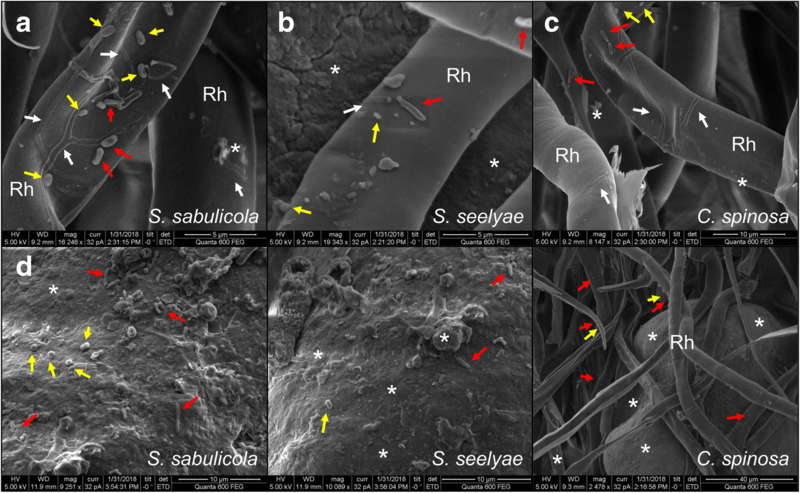 In order to evaluate the root microbiome recruitment strategies employed by desert speargrasses, we studied the root, rhizosheath and rhizosphere bacterial and fungal communities of three endemic-perennial Namib Desert speargrass species (Stipagrostis sabulicola, Stipagrostis seelyae and Cladoraphis spinosa) with a combination of scanning electron microscopy and molecular microbial ecology tools (qPCR and meta-barcoding). These selected plant species colonized the slope of a single dune in the central Namib Desert , allowing us to minimize the interference of factors such as biogeography, climatic or edaphic characteristics that could affect environmental microbial communities . By exploiting this unique environmental setting, we aimed to disentangle the relationships between microbial communities and rhizosheath-root systems and to address fundamental questions on the recruitment strategies in the plant rhizosheaths. The assembly of microbial communities in the plant rhizospheric zone is predominantly driven by the plant type in the natural ecosystem [27, 28]. However, due to the extreme environmental conditions in deserts, which drive a strong deterministic process of selection [29, 30], desert soil microbial diversity is reduced (i.e., lower biomass and richness) when compared to more productive ecosystems or arid soils under desert-farming management [3–6]. Consequently, we hypothesize that, in the Namib Desert dunes, the impact of plant species on the recruitment of their associated root system microbiota from the surrounding sandy soils would be minimal and thus that stochasticity would be a dominant driver [30, 31]. Nevertheless, we also expect niche-partitioning to play a role in the assembly process, and to detect a subset of phylogenetically consistent microbial groups (i.e., plant growth-promoting [PGP] microorganisms) that are ‘plant-species’- and/or ‘rhizosheath-root system compartment’-specific . The speargrasses studied were located on different slope sections of a single ~ 6 m high dune (Fig. 1a, chemical analysis Additional file 1: Table S1): S. sabulicola (Fig. 1b) occupied the middle/upper part of the dune slope (4.5 ± 0.15 m linear distance from the bottom of the slope), while both S. seelyae (Fig. 1c) and C. spinosa (Fig. 1d) grew on the lowest section of the dune slope (1.71 ± 0.17 and 1.4 ± 0.18 m, respectively). All three speargrass species showed a root system with a rhizosheath structure (Fig. 1e–g; schematic representation in Fig. 1h). The rhizosheaths appeared as thick and compact sandy cylinders covering the entire length of all roots, with an external layer composed of sand grains and root hairs (Fig. 1i). No significant differences between the rhizosheath diameters of the three speargrasses, defined as the sand physically attached to the root system (Fig. 1h; ), were observed (F2,27 = 0.83, p = 0.44). In contrast, mean root diameters differed significantly with plant species (F2,27 = 23.80, p < 0.0001): the largest for to S. sabulicola and the smallest for C. spinosa (Additional file 1: Table S2). High magnification cross sections of intact rhizosheaths revealed the complex structure of this system (Fig. 1j–l), consisting of numerous long root hairs tightly binding fine and very fine sand particles and forming stable packaged arrangements (Fig. 1h, j–l). The surfaces of root hairs and sand grains showed flaky surface materials (stars in Fig. 2), possibly composed of mucilage and exopolymers released from roots and/or microorganisms [13, 14]. Magnified micrographs indicated the presence of microbial cells of different morphologies (including rod-shaped, coccus-shaped and filamentous bacteria, together with fungal hyphae) colonizing both the root hairs and the surfaces of sand particles (Fig. 2). Bacteria were ubiquitously detected in the entire rhizosheath-root system, while fungi were not found in any root interior tissue. Quantification of copies of the bacterial 16S rRNA gene and of the fungal 18S–28S ribosomal internal transcribed spacers (ITS) suggested a progressive enrichment of the bacterial and fungal marker genes from the bulk sand (8.3 ± 3.3 × 105 and 2.2 ± 0.8 × 104 of bacterial 16S rRNA gene and fungal ITS copies per gram of sand, respectively) to the rhizosphere (5.7 ± 0.7 × 107 and 4.8 ± 0.8 × 106 copies per gram of rhizospheric sample), reaching the highest values in the rhizosheath (2.66 ± 0.3 × 108 and 4.6 ± 1.2 × 107 copies per gram of rhizosheath; multiple comparisons in Fig. 3a and b). There was a general dominance of bacteria (bacteria/fungi ratio: rhizosheath = 9 ± 1, rhizosphere = 15 ± 2 and bulk = 175 ± 117) at all sites. Inner root tissues showed lower bacterial 16S rRNA gene copy numbers (3.7 ± 1.7 × 107), while fungal ITS sequences were non-detectable (Fig. 3a, b; ). Only the abundance of rhizosheath and rhizospheric 16S rRNA bacterial gene copies were differently affected by the plant host, with significantly higher values in S. sabulicola rhizosheath when compared to the other two species (Fig. 3a). A total of 3224 bacterial 16S rRNA gene and 405 fungal ITS unique sequence variants (SVs) were identified globally in the rhizosheath-root system compartments and bulk sand samples (Table 1). 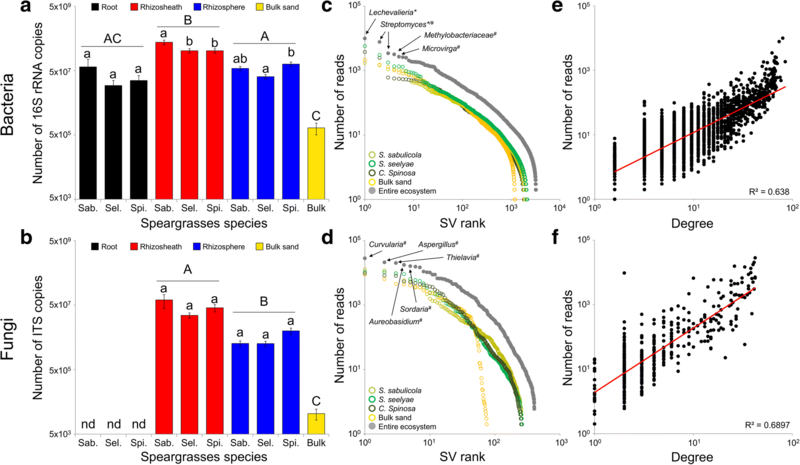 Their distribution displayed a ‘dropping tail’ shape, with few abundant SVs and a large number of ‘rare’ SVs (bacterial and fungal reads abundances ranged from 2 to 99,585 and from 6 to 282,970, respectively; Fig. 3c, d). A significant relationship between microbial-occurrence in samples (degree) and microbial-abundance was detected, indicating a non-random SVs’ distribution across plant hosts (bacteria: adjusted r2 = 0.64, slope = 1.5, p < 0.0001; fungi: adjusted r2 = 0.69, slope = 2, p < 0.0001; Fig. 3e, f). We found that the majority of the plant-associated bacterial and fungal SVs originated from the surrounding bulk sand (64 and 84%, respectively; Fig. 4a and Additional file 1: Figure S1). The bipartite network plot confirmed the selective process exerted by the rhizosheath-root systems and observed by the gene copy quantification: SVs present in the bulk sand were recruited by the rhizosheath and rhizosphere compartments and were then further filtered by the root rhizoplane barrier to finally become endophytic (Fig. 4a). Furthermore, each rhizosheath-root system compartment was found to have specifically associated microbiomes. This is further highlighted by the fact that only ~ 2% of the SVs were ubiquitously detected; i.e., associated to all the compartments of the rhizosheath-root system (Additional file 1: Figure S1 and S2). However, when excluding root tissues from the analysis, 35%–39% of bacterial SVs were found shared between the rhizosheath and the rhizosphere in the three species. Similarly, 54–59% of fungal SVs were shared between these two compartments. Altogether, and as no fungal SVs were detected in the plant roots, this confirmed that roots represent a strong filter in the process of plant root colonization by microorganisms . Interestingly, when comparing the rhizosheath-root system microbiomes of the three speargrass species, ternary plots showed that most of the SVs had a generalist distribution (represented by the spheres in the middle of the triangles) instead of a host-specific distribution (spheres in the summit or along the edges of the triangles; Fig. 4b, c), with 35% of bacterial SVs and 37% of fungal SVs shared among all three plants. This represented 88% and 97%, respectively, of the total community (Fig. 4d, e). These values were conserved along the rhizosheath-root system compartments (Additional file 1: Figure S3). A global segregation between the microbial community associated to rhizosheath-root system (host) and bulk sand was observed (PERMANOVA, bacteria: F1,67 = 6.11, p = 0.001; fungi: F1,47 = 8.06, p = 0.001), explaining up to 42% and 34% of the total compositional (Bray-Curtis) variation of bacterial and fungal taxa, respectively (Fig. 5a, b). Furthermore, for each plant species, a relatively high variability in rhizosheath-root system composition was observed (distance from centroid: bacteria 0.2–0.8 and fungi 0.4–0.8) compared to the surrounding bulk sand (bacteria 0.2–0.4 and fungi 0.3–0.5; Additional file 1: Table S3). However, no differences in the variability of plant species-associated microbial communities were observed (bacteria and fungi: p > 0.05; Additional file 1: Table S3). More specifically, bacterial assemblages were significantly driven by the interaction of plant species and rhizosheath-root system compartments (bacteria: F4,57 = 2.078, p = 0.001; fungi: F2,39 = 0.740, p = 0.84), with the compartments being the major contributor (43%, Additional file 1: Table S4a; multiple comparisons in Additional file 1: Table S4b). For the fungal assemblages, the assembly was mainly driven by plant species (F2,39 = 6.211, p = 0.001; estimates of components of variation, 26%, Additional file 1: Table S4a; multiple comparisons in Additional file 1: Table S4c). Mantel test results revealed a significant correlation (p < 0.05 in Additional file 1: Table S4d) between the compositional variation of bacterial and fungal rhizosheath and rhizosphere beta-diversity values and distance from the dune base (habitat-niche). This was not observed for the root bacterial communities (Additional file 1: Table S4d). Furthermore, a significant decline in compositional similarities with linear distance was also found for the rhizosheath and rhizosphere sandy compartments (Fig. 5c, d; Additional file 1: Table S5). Altogether, these results show that the closer the proximity of the individual plants, the more similar their rhizosheathic and rhizospheric communities were, and vice versa; i.e., that communities from S. seelyae and C. spinosa that are localized on the middle/low section of the dune hosted similar communities, when compared to those of S. sabulicola which grew near the dune top. In contrast, the root endophytic bacterial communities were not significantly influenced by inter-plant distance (Fig. 5c and Additional file 1: Table S5), further suggesting the strong selection of the endophytic root microbiome by the speargrass, independent of their location and plant taxonomy. Bacterial and fungal communities were characterized by different alpha-diversity (richness and evenness) trends (Table 1). While bacterial communities hosted by sandy-compartments of rhizosheath system (rhizosheath and rhizosphere) showed similar alpha-diversity values compare to bulk sand, the fungal alpha diversity values were significantly higher than those of the bulk sand (multiple comparisons in Table 1). The endophytic root bacterial communities were always significantly less diverse (low richness) and more equal (high evenness) than all the sand-dominated samples (rhizosheath, rhizosphere and bulk sand). Furthermore, speargrass species did not influence root tissue bacterial alpha diversity but affected the richness and evenness of rhizosphere microbial communities (Table 1). S. seelyae presented the lowest bacterial evenness and the highest bacterial richness, and S. sabulicola exhibited the highest fungal evenness. In the rhizosheath, plant species only influenced the richness values, with variable effects for bacterial and fungal communities (Table 1). Phylogenetic diversity was measured using different metrics: phylogenetic distance between SVs (PD/SV), nearest taxon index (NTI) and mean relatedness index (NRI). The PD/SV ratios of the rhizosheath-root system bacterial communities did not differ between plant species or with the bulk sand (F3,64 = 0.24, p = 0.9; Newman-Keuls multiple comparison p > 0.05; Table 2). This was also observed when considering each compartment individually (root: F2,16 = 0.489, p = 0.6; rhizosheath: F2,18 = 0.034, p = 0.1; rhizosphere: F2,18 = 1.9, p = 0.2). Conversely, fungal communities showed a significantly lower phylogenetic diversity in plant-influenced compartments when compared to the bulk sand (F3,45 = 341.8; p < 0.0001). Bulk sand bacterial communities and all fungal communities were found to be randomly structured phylogenetically (p > 0.05; Table 2), while the rhizosheath-root system bacterial communities were significantly clustered for both NRI (1.6 < NRI < 11.2; p < 0.05) and NTI (0.9 < NTI < 8.9; p < 0.05) metrics without significant changes within the different plant species (Table 2). Moreover, the lack of correlation between sequencing depth and NRI (linear regression: bacteria, p = 0.08; fungi, p = 0.33) or NTI (linear regression: bacteria, p = 0.22; fungi, p = 0.69) suggested that the addition of infrequent taxa to the communities would not alter the phylogenetic structure. The low phylogenetic alpha diversity of speargrass-associated microbial communities and absence of any correlation between these communities and the position of the plants along the dune slope (Mantel test, Additional file 1: Table S6) indicated that the three speargrasses species hosted similar microbial communities (p > 0.05; Table 2). The phylogenetic relatedness of the bacterial and fungal communities was analysed by calculating both the ‘basal’ and ‘terminal’ metrics of phylogenetic beta diversity (ßNRI and ßNTI, respectively), in order to evaluate the phylogenetic turnover . Both ßNRI- and ßNTI-bacterial scores were between − 2 and + 2 (0.32 < ßNRI< 0.66; 0.02 < ßNTI< 0.44), which is consistent with random phylogenetic turnover; i.e., where stochastic and/or ecologically-neutral factors play important roles in community assembly, a process known as neutral community assembly . Similarly, fungal communities showed a neutral rhizosheath-system community assembly, with both ßNRI and ßNTI values between − 2 and + 2 (1.11 < ßNRI< 1.59; 0.09 < ßNTI< 0.82). No correlation between the phylogenetic beta diversity metrics and spatial distance among speargrass rhizosheath habitat-niches was detected (Mantel test, p > 0.05), suggesting a consistent stochastic mechanism of assembly of the rhizosheath-root system microbial communities. This is most probably linked to the low biomass and richness/phylogenetic alpha diversity detected in the bulk sand communities, from which the rhizosheath-root system microbial communities are recruited (Fig. 3; Tables 1 and 2). The complete phylogenetic dataset comprised a total of 21 bacterial phyla (99.8% sequences classified), 51 classes (96% classified), 68 orders (93% classified), 114 families (88% classified) and 215 genera (72% classified; Additional file 1: Table S7a). The interaction of plant species and rhizosheath-root system compartments significantly influenced the distribution of bacterial taxa at the phylum/class and family levels (phylum/class: F4,53 = 2.09, p = 0.026; family: F4,53 = 2.65, p = 0.001; Additional file 1: Table S8a and b). Notably, the few abundant bacterial members (SVs), accounting for 15% relative abundance, were affiliated to Actinobacteria (5 and 6% to Lechevalieria and Streptomyces, respectively) and Alphaproteobacteria (1.5 and 1.7%, Microvirga [reclassification of Balneimonas] and Methylobacteriaceae, respectively; Fig. 3c). In particular, plant-associated rhizosheath and rhizosphere communities showed high abundances of Actinobacteria (49–62%) and Alphaproteobacteria (26–38%) while root tissues were mainly dominated by Firmicutes (50–65%), with Gammaproteobacteria (1–25%) and Actinobacteria (7–10%) in lower abundance. Bulk sand bacterial communities were mainly composed of Alphaproteobacteria (37%), Actinobacteria (29%) and Chloroflexi (28%; Fig. 5e, Additional file 1: Table S7a). At the family level, Pseudonocardiaceae, Streptomycetaceae, Methylobacteriaceae, Nocardioidaceae, Hyphomicrobiaceae, Microbacteriaceae and Micrococcaceae showed specific distributions in the rhizosheath and rhizosphere compartments, while Bacillaceae, Rhizobiaceae and Pseudomonadaceae were the dominant taxa in the root tissues, but with a host-specific distribution (Additional file 1: Table S9a). In fungal communities six phyla were detected (92% sequences classified), distributed across 22 classes (85% classified), 37 orders (84% classified), 57 families (73% classified) and 72 genera (70% classified; Additional file 1: Table S7b). The classes Sordariomycetes, Eurotiomycetes and Dothideomycete (all Ascomycota) equally dominated the datasets (Fig. 5f). The global fungal class distribution was significantly affected by plant species (F2,39 = 2.51, p = 0.027; Additional file 1: Table S8b). At a lower taxonomic rank (genus), fungal composition was significantly influenced by both plant species and rhizosheath-root system compartments (F2,39 = 5.73, p = 0.001 and F1,40 = 2.10, p = 0.008, respectively; Additional file 1: Table S8d), with 26% of the genera showing a different abundance in function of the plant species (for instance, Fusarium and Volvopluteus) and only one genus (Cladosporium) in function of compartments (Additional file 1: Table S9b). Among fungal genera, members belonging to the Curvularia, Aspergillus, Thielavia, Aureobasidium and Sordaria (all Ascomycota) showed high relative abundance (28% of all reads; Fig. 3d) with a generalist-distribution(FDR-p > 0.05) independent of plant species or compartments. A significantly higher number of microbial (bacterial and fungal) community members in the three plant rhizosheath-root systems (147 in S. sabulicola, 162 in S. seelyae, 168 in C. spinosa) than in the bulk sand (66) established significant and non-random interactions. Such pattern was observed for the numbers of co-occurrences as well (1117, 562, 1189 and 303, respectively; Fig. 6; Table 3); bulk soil showed only co-presence relationships, while speargrass rhizosheath-root systems showed both co-presence and mutual exclusion (Fig. 6). Furthermore, the microbial components (nodes) of the three speargrass networks showed significantly different degrees of connection (F2,452 = 58.01, p < 0.001; highest for S. sabulicola), closeness centrality (F2,452 = 107.52, p < 0.001; highest for S. sabulicola), betweenness centrality (F2,452 = 4.11, p < 0.05; highest for S. seelyae) and average shortest path length (F2,452 = 107.52, p < 0.001; highest for S. seelyae). Each plant species had also a characteristic taxonomic profile with respect to central interactions (edge betweenness centrality: F56,3259 = 5.50, p < 0.001; Additional file 1: Figure S4). For C. spinosa, central interactions originated principally from Actinobacteria co-occurring with fungi, Saccharibacteria interacting with Actinobacteria and Firmicutes and Basidiomycota co-occurring with Ascomycota and Actinobacteria. For S. seelyae, dominant central interactions were between Acidobacteria and Saccharibacteria, and for S. sabulicola, between Alphaproteobacteria and Betaproteobacteria, albeit with lower values (Additional file 1: Table S10 and Additional file 1: Figure S4). SVs belonging to Deltaproteobacteria, Gammaproteobacteria, Bacteroidetes, Cyanobacteria and Arthoniomycetes (1.6 and 0.8% of the total bacterial and fungal reads, respectively) did not show significant co-occurrences with any other microbial community taxon. Members with high degrees of co-occurrence (top 5%) were identified as hubs. All the detected hubs had medium/low relative abundance (as counts per million, CPM; Fig. 6) and were taxonomically affiliated to Actinobacteria and Alphaproteobacteria, with Planctomycetes in S. seelyae (Additional file 1: Table S10, see hub column in node tables). More hubs were detected in speargrass rhizosheath-root system networks (8, 8 and 9 hubs in S. sabulicola, S. seelyae and C. spinosa, respectively) when compared to the bulk sand (3 hubs; Additional file 1: Table S10). All these hubs established heterogeneous interactions with bacterial and/or fungal nodes, depending on the plant species (Additional file 1: Table S10, see edge tables). Interestingly, only three hubs, belonging to the Microvirga genus (one of the most abundant taxa detected overall, Fig. 3a), were identified in all the plant-related networks, while the other hubs were plant- and bulk sand-specific. Keystone taxa were defined as taxa interacting with many other members (i.e., top 1% of interactions); such taxa are thought to play crucial roles in the overall community . The four meta-networks hosted a keystone species belonging to the Alphaproteobacteria class (genus Pseudochrobactrumin S. sabulicola, genus Microvirga in S. seelyae, C. spinosa and bulk sand; Additional file 1: Table S10, see keystone column in node tables). Only the C. spinosa network showed a second keystone species, affiliated to the Actinobacteria phylum (genus Nonomuraea; Fig. 6; Additional file 1: Table S10). The complex moisture/sand mobility gradient along the slope of Namib Desert dunes determines specific micro-niches that strongly influence the species, number and distribution of perennial speargrasses [26, 35]. According to Yeaton , S. sabulicola is well adapted to grow on the upper dune slopes which are characterized by very mobile sand and higher moisture availability. With increasing sand stability and lower moisture; i.e., moving towards the dune base, others speargrasses, such as S. seelyae and C. spinosa, are typically found [9, 26, 35]. In the higher parts of the dunes, plants with strong root systems are more successful at establishing in moving sands , as indicated by the significantly wider diameter of the rhizosheath-root system (entire and single root internal tissues) of S. sabulicola. Beside the genetic predisposition for rhizosheath development, soil properties and soil texture/granulometry [36, 37] delineate the final shape and size of the rhizosheath. This explains the fact that rhizosheath width (sandy coating) of the three speargrasses growing in the same sandy substrate was similar. In dry soils and xeric-stressed environments (e.g. desert and gravel plain soils) rhizodeposition occurs around and along the entire root length resulting, in some species, in the formation of a compact rhizosheath structure associated with plant stress tolerance . Such rhizosheaths were always significantly enriched in microbial cells, even compared to the rhizosphere. The structure and composition of the rhizosheath, which includes the presence of exudates, mucigels and exopolymers, increases the wettability and water absorption capacity of the root system and generates a favourable microenvironment  for the establishment of highly diverse bacterial and fungal populations [14, 24, 25, 33]. The higher number of cells associated with the rhizosheath is supported by the microscopic observations of numerous bacteria and fungal hyphae associated with root hairs and sand grains [14, 33, 38]. Recruitment of microaggregates (< 250 μm, i.e., fine and very fine sand) by the rhizosheath compartment may also drive greater microbial diversity . For recruitment, diversity and interactions of the microbiome components associated with the rhizosheath-root system of desert speargrasses, abiotic filtering (deterministic factors) imposed by the harsh conditions of the desert  reduces the microbial pool available in the surrounding bulk sand to a limited number of members sharing similar adaptive-traits , which may contribute to their adaptation and survival [6, 19, 41]. Through a process most probably mediated by the plant rhizodeposition, the rhizosheath-root system of speargrass selects its microbiome from the microbial pool present in the surrounding sand. An additional selection step, at the rhizoplane level, allows only certain bacteria to colonize the root tissues . This selective process ultimately leads to a sequential differentiation within the successive compartments of the rhizosheath-root system of the three speargrass species, supporting the concept that root compartmentalization is the major driver of plant-microbe interaction in arid and semi-arid environments [19, 41]. Recent omics-based analyses have shown that plant seeds contain microbes that can be transmitted from one plant generation to the next and have profound impacts on plant ecology, health and productivity . Seeds’ microbiome can be both vertically transmitted from plant tissues and horizontally transferred from the surrounding environment (i.e. sand); it represents the culmination of a complex process of microbial interactions mediated by plant throughout its life cycle . In the rhizosphere of juvenile maize (21 days old) grown in both sterile and non-sterile substrates, identical dominant bacterial were observed, indicating seeds as a source of inoculum . However, rhizospheres developed in non-sterile substrates harboured greater bacterial diversity than sterile ones, confirming that the surrounding soil remains very important in determining the assembly and structuring of rhizospheric communities [32, 45]. The observed filtering process mediated by the rhizosheath-root system suggests that a reduced number of bacteria, and possibly no fungi, can be vertically transferred to the speargrass seeds and that the surrounding environment (i.e. sand) represents the main source of microorganisms associated with such perennial plants. In the rhizosheath-root structure, a homogeneous distribution of microorganisms among the three plant species was observed, defining a ‘core microbiome’, in which the microorganisms available in the sand colonize the different host species . In addition, the prevalence of microbial generalists over specialists indicates an inter-species sharing of the rhizosheath-root system microbiota among speargrass, possibly as a consequence of a weak selection mediated by the plants due to stochastic factors. Such factors may include probabilistic processes that homogenize sand microbial communities, such as sand mobility and random changes in microbial species relative abundances (ecological drift [30, 31]). As frequently observed in soils, both deterministic and stochastic forces act on desert microbial populations [2, 7, 29, 30, 47]. This complex balance is mainly influenced by stochasticity [30, 48]. Abiotic filtering (i.e. the desert microenvironment) and biotic interactions (i.e. rhizosheath; sensu ) favour the over-representation of tolerant clades, possibly to the exclusion of non-tolerant phyla . Consequently, in extreme ecosystems, the phylogenetic structures of microbial communities are expected to converge in low-diversity communities [30, 48]. In the rhizosheath-root system of the three speargrass species, a consistent microbial assembly process was observed. This was found to be largely neutral and principally driven by abiotic and biotic filtering (from desert dune conditions and the rhizosheath-root system). Plant species-related factors were found to be too weak to impose selection, minimizing the effects of differences in phylogenetic affiliation, radical exudation profiles and/or physiological status of speargrasses species [28, 31]. In a more controlled arid ecosystem, such as desert-farms, in which soil microorganisms are more abundant and diverse than the ones in barren sand , plants genotype were found to be important drivers of rhizospheric microbial taxonomical and functional (e.g. nitrogen fixation) diversities [3, 5]. Not surprisingly, Actinobacteria, Alphaproteobacteria and Chloroflexi dominated the Namib Desert bulk dune sand communities. These ubiquitous phyla have been detected in desert sand at a global scale and include members well known for their multiple genetic and physiological mechanisms of resistance to arid and oligotrophic desert conditions . These include the possession of multi-stress related genes and physiological resistance mechanisms to the arid and oligotrophic desert conditions . For instance: the Chloroflexi’s protective layered cell envelope structure , or sporulation of Actinobacteria and some Alphaproteobacteria [54, 55]. Actinobacteria and Alphaproteobacteria were also found to be abundant in the rhizosheath-root systems of the three speargrass species, while the relative abundance of plant-associated Chloroflexi was low. Notably, the most abundant actinobacterial and alphaproteobacterial taxa in the rhizosheath-root systems of the three speargrass species are known to be plant-associated bacteria with PGP potential [18, 25, 56]. Firmicutes were enriched only in the internal root tissues. Fungi are well-known for high levels of stress-resistance and for their capacity to tolerate desiccation . However, their roles in the rhizosheath-root system remained unclear [12, 14, 38], although it is likely that the mycelial morphology contributes to the stability of the rhizosheath structure. The rhizosheath and rhizosphere compartment of speargrass species were all enriched in fungi belonging to the Arthoniomycetes, Dothideomycetes, Eurotiomycetes and Sordariomycetes classes (all in the Ascomycota phylum). Among these, the most abundant genera included Curvularia, Aspergillus, Sordaria, Thielavia and Aureobasidium. Isolated members from these fungi groups have showed heterogeneous characteristics ranging from saprophytes to plant pathogens ; many of these genera also possess PGP potential (e.g., biological control of plant diseases ). Intra- and inter-kingdoms interactions have previously been found to be important in shaping desert soil microbial communities [60, 61]. Bacterial and fungal components interact to form complex microbial networks in the rhizosheath-root system of the three speargrass species. In contrast, in bulk sand, disconnected micro-habitats and the presence of higher numbers of dormant cells may explain the lower complexity and the identification of co-presence interactions only . 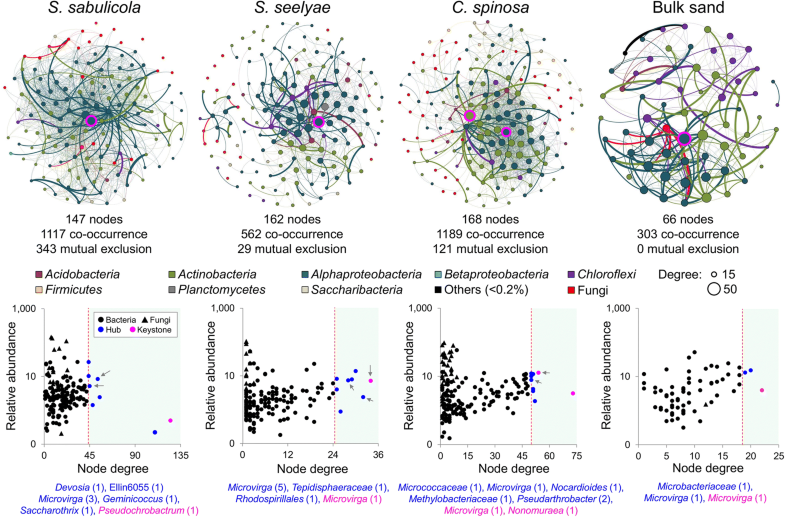 Microbial hubs with high degrees of connection (up to 5%) are considered to play crucial roles within a given microbiome, and among these, the top 1% (i.e., the keystone taxa) maintain the network stability and structure . Hub taxa were mainly affiliated to Alphaproteobacteria, with few Actinobacteria and Planctomycetes. A number of hub and keystone microbial species were specific of the three speargrasses, possibly linked to the microdiversity (SVs) of phylogenetically close taxa with conserved functional traits . Only three SVs belonging to the genus Microvirga were identified as hubs in the microbial network of all the three plants. Members from this genus are soil bacteria which can proliferate in arid conditions  and provide nutrients, such as nitrogen, to plants (e.g. legume symbionts, ) and surrounding microbial communities (e.g. in desert soil,  and biological soil crusts ). Microvirga species genomes also contain genes coding for chemotaxis, motility and exopolysaccharide synthesis proteins, which facilitate movement toward and adhesion to areas of favorable nutrient conditions [66, 67], such as the rhizosheath-root systems of speargrasses. Microvirga are also capable of iron acquisition via siderophores . Such ‘opportunistic’ interactions with the others members of the community, along with the capacity of Microvirga species to perform key biogeochemical processes (organic nutrient mineralization and nitrogen fixation) and to stabilize rhizosheath structures (via the production of exopolysaccharides; ) may explain their central role as keystone species in the microbial networks of both rhizosheath-root systems and bulk sand. Notably, as in plant-microbe symbiotic relationships, microorganisms have evolved a structured and intimate relationship with their plant host  in which functional redundancy is crucial for maintaining a functioning ecosystem, especially when stresses are present . In the case of speargrasses, the favourable ecological-niche created by rhizosheath-root system constitutes a refuge for microorganisms carrying biofertilization and biopromotion PGP activities (e.g., nitrogen metabolism and water retention; [11, 18, 25]) which are essential for survival in nutrient-poor arid soils. The relative simplicity of desert ecosystems, characterized by low microbial and plant diversities, allowed the evaluation of rhizosheath-root system recruitment processes and the elaboration of new general concepts in plant-microbe interactions. The present contribution provides a comprehensive study on how speargrasses species adapted to sandy desert recruit the microbial communities of their created niches (rhizosheath, rhizosphere and root) mainly from the surrounding soils. In fact, the uniqueness of rhizosheath-root system and the strong selection driven by the harsh condition of the desert ecosystems determine a stochastic (random) recruitment process conserved in all the three Namib Desert endemic plant species analysed. Experiments growing these plants in more controlled laboratory settings with different soils (e.g., oligotrophic vs rich) and with various microbial inocula (e.g., sterilized soils with different microbial inoculum complexities) will be useful to further dissect the stochasticity of the recruitment process in the speargrasses rhizosheath root systems. Even though the microbial community assembly is independent from the plant host, it yet favours the fitness of the hosts. Our finding supports the concept that the selection determined by the low-resource condition of the desert sand prevails on that imposed by the genotype of the different plant species, suggesting that the desert microbial community assembly processes of plant-associated niches differ from those occurring in the resource-rich soils [3, 5]. Interestingly, the rhizosheath-root system has been demonstrated to be a ‘hot spot’ for microbial diversity that as previously demonstrated have the capacity to perform PGP functions and services involved in plant growth promotion (e.g. nitrogen fixation, ) and protection under stress conditions (e.g. exopolysaccharide production ). These results therefore lead to the better understanding and future modelling of plant-microbe interactions in hot and arid environments, which could be fundamental in predicting plant (including food-crop) adaptation to global climate change. In April 2017, three different species of speargrasses growing on the eastern part of a single linear dune of the Namib Desert (longitude, S 23°43′56.38″; latitude E 15°46′26.39″) were selected for this study. The plants have been identified by morphological recognition as S. sabulicola, S. seelyae (in literature previously defined as S. namaquensis) and C. spinosa. The selected plant species were distributed along the dune following a conserved pattern and formed a consistent ecological setting across the eastern edge of the Namib Desert (Fig. 1a; [26, 33]). For each species, the rhizosheath-root system of seven randomly selected healthy speargrasses of similar size was collected. Only mature plants with well-defined rhizosheath-root systems were sampled to minimize the potential role of developmental stage in microbial communities recruitment and assemblage . After removing the sand covering the plants’ root systems, the rhizosheath-root system was sampled using sterile scissors and tweezers at 10–30 cm from the collar and placed in 50 ml sterile tubes. In addition, bulk sand samples (10–15 cm depth; n = 7) were collected. All the samples were collected under the research/collection permit number 2248/2017 (Namibian Ministry of Environment and Tourism). In the laboratory, sand that was not tightly bound to the rhizosheath structure and that collected at the bottom of the tubes was transferred to 2 ml sterile tubes. Such sand was defined as belonging to the rhizosphere following the classification revised by Pang et al., . The rhizosheath, which is the sandy coating physically adhering to the plant root , was physically separated from the inner root tissues (internal tissues) using a sterile scalpel. Samples were stored at 4 °C for soil chemical analysis and at − 20 °C for molecular analysis. Intact samples of rhizosheath-root systems collected from the three speargrass species were preserved and fixed in a solution of 3% glutaraldehyde in cacodylate buffer (Electron Microscopy Sciences, PA, USA) at 4 °C. Samples were rinsed three times for 15 min with a solution of 0.1 M Na-cacodylate buffer and further post-fixated in the dark for 1 h using a 1% osmium tetraoxide solution prepared with 0.1 M Na-cacodylate buffer. After post-fixation, samples were rinsed with distilled water three times for 15 min. Dehydration steps of 15 min were performed using a series of ethanol solutions of increasing concentration up to 100% (ethanol gradient: 30%, 50%, 70%, 90%, 100%). After reaching the 100% ethanol step, samples were rinsed again twice with absolute ethanol for 15 min and kept overnight in the same solution. Drying of samples was performed through evaporation of hexamethyldisilazane (HMDS) with steps of 15 min using gradually increasing concentrations of HMDS in absolute ethanol (33%, 66%, and 100% HDMS), and the last step was repeated for 1 h. When the sample was submerged in the final 100% HMDS solution, it was left loosely capped in a fume hood until all the HMDS solution had evaporated. Dried roots were attached to aluminium stubs with carbon tape and coated with a 5 nm layer of Au/Pb using a K575X sputter coater (Quorum) and visualized with a SEM Quanta 600 FEI of the KAUST Imaging and Characterization Core Lab at a working distance of 9.3 mm and a high voltage of 5.00 kV. The total DNA extraction of sandy compartments (bulk sand, rhizosphere and rhizosheath) was performed using 0.5 ± 0.05 g of sample and the PowerSoil® DNA Isolation Kit (MoBio Inc., USA). For the root tissues, the surface was previously sterilized as described by Cherif et al.,  and subsequently grinded in liquid nitrogen with sterile mortar and pestle. The total DNA extraction of the root tissues was performed using one gram of the grinded tissue and the DNeasy Plant Maxi Kit (Qiagen, Germany). For the analysis of bacterial community composition, a PCR amplification of the V3-V4 hypervariable regions of the 16S rRNA gene was performed to the extracted DNA using universal primers (341f, 785f) as described by Mapelli et al., . For fungal communities, amplification of the ITS2 region was performed using the primers ITS3f and ITS4r as described by Tedersoo et al. . Both libraries were constructed with the 96 Nextera XT Index Kit (Illumina) following the manufacturer’s instructions. Library sequencing was done using the Illumina MiSeq platform with pair-end sequencing at the Bioscience Core Lab, King Abdullah University of Science and Technology. All sequenced reads were deposited in the NCBI database under the SRA accession numbers SRP153940 and SRP153934 for bacteria and fungi, respectively. Raw forward and reverse reads for each sample were assembled into paired-end reads (minimum overlap of 50 nucleotides and maximum of one mismatch within the region) using the fastq-join algorithm (https://github.com/brwnj/fastq-join) and analysed using the DADA2 pipeline as described in Callahan et al., . Quality filtering, trimming, dereplication, and paired-end merging of the sequences were applied together with the final removal of sequence variants (SVs) presented in single copy and SVs classified as chloroplast (65, 8, 0.05 and 0% of sequences in root tissues, rhizosheath, rhizosphere and bulk soil, respectively). A total of 1,830,127 (average length of 405 bases) and 3,669,396 (average length of 310 bases) sequences were finally obtained for bacterial and fungal components, respectively. All samples analysed presented a suitable sequencing depth and diversity (Good’s coverage values > 98%). SVs were clustered  and then taxonomically assigned using the SILVA 132 database for bacteria and the UNITE database for fungi. Absolute abundances of the number of copies of the bacterial 16S small subunit rRNA gene and the fungal ITS region were determined following the method described elsewhere, using the primer-sets Eub338/Eub518 and ITS1F/5.8 s respectively [72, 73]. For bacteria, the fragment of interest was amplified from environmental DNA (size ± 180 bp), while for fungi, it was obtained using the genomic DNA of Saccharomyces cerevisiae NCYC 1006 (± 450 bp). PCR products were purified with the Wizard® SV Gel and PCR Clean-Up System (Promega) and ligated to vectors pCRTM 2.1-TOPO®. The plasmids were then cloned into TOP10 Escherichia coli competent cells (TOPO® TA Cloning® Kit, Thermo Fischer Scientific). The plasmids, isolated from LB over-night cultures of the transformant E. coli using the Pure Yield Plasmid Miniprep (Promega), were used as a template to amplify the region of insertion of the fragment of interest with the primer-set M13F(-20)/M13R. PCR products were purified and then quantified using the Qubit dsDNA BR Assay Kit (Thermo Fisher Scientific). Series of standards were prepared through tenfold serial dilutions of the quantified PCR product using the Robotic workstation Qiagility (Qiagen) and stored at − 20 °C. Quantitative PCR reactions were set up with the Qiagility and were carried out on a Rotor-Gene Q thermocycler (Qiagen). All the samples were first quantified with Qubit dsDNA BR Assay Kit. Dilutions to 1 ng/μl of each sample were prepared to be used as template DNA for the qPCR runs. When the concentration of a sample was too low, such sample was used undiluted. One bulk sample was chosen as inter-run calibrator: it has been quantified in all qPCR experiments and then all the results have been normalized against it. Reaction mixes were prepared with the GoTaq® qPCR Sybr Green Master Mix (Promega). The volume of the reaction mix was 15 μl, containing 1X GoTaq® Master Mix, 100 nM of each primer for bacteria, while 400 nM for fungi, and 1.5 μl of template DNA. PCR conditions were the following: 95 °C for 2 min, 45 cycles at 95 °C for 15/40 s (respectively, bacteria/fungi), 53/55 °C for 20/40 s and 60 °C for 20/60 s; finally, melting curves were obtained through 91 cycles from 50 °C to 95 °C with increase of 0.5 °C/cycle every 5 s. Standard curves were constructed with a series of dilutions ranging from 50 to 5 × 107 copies of PCR product per microliter. All the standards and the samples were run in triplicate. R2 between 0.99309 and 0.99908 and amplification efficiencies between 89% and 99% were obtained across the three different qPCR assays performed with both primer sets. To compare numbers of bacteria and fungi hosted by plant species and rhizosheath-root system compartments, the non-parametric Kruskal Wallis and post hoc Dunn’s multiple comparison tests were used. Bipartite network analysis was performed to the bacterial and fungal communities associated with the bulk soil, rhizosphere, rhizosheath and root tissues of the three species of speargrass using the Quantitative Insights Into Microbial Ecology (QIIME) script make_bipartite_network.py and visualized using the Gephi software . Shared and exclusive SVs among the different compartments and speargrass species were calculated as described in Marasco et al., , using Venn diagram software available at http://bioinformatics.psb.ugent.be/webtools/Venn/. Ternary plots were obtained using R package (ggtern) to depict the distribution of bacterial and fungal SVs among the three different plant species . Similarity matrices, Principal Coordinates Analysis (PCoA) and permutational multivariate analyses of variance (PERMANOVA, main and multiple comparison tests) have been performed on the compositional (Bray-Curtis of the log-transformed SV table) matrices in PRIMER . The considered explanatory variables were ‘Plant species’ (three levels: S. sabulicula, S. seelyae, C. spinosa), ‘Compartment’ (four levels: root tissues, rhizosheath, rhizosphere, bulk sand) and their interaction (‘Compartment’ × ‘Plant species’). The occurrence of distance-decay patterns in rhizosheath-root system compartments has been tested using the linear regression (GraphPad Prism 7 software, La Jolla California USA, www.graphpad.com) between the dissimilarity of bacterial communities (Bray-Curtis) and the distance among plant species. Covariance of regressions was tested using paleontological statistics (PAST) software (one-way analysis of covariance (ANCOVA)). Alpha diversity indices (richness and evenness) were calculated using the PAST software. To evaluate the phylogenetic community assembly, measures of phylogenetic alpha diversities (Faith’s PD, NRI and NTI) were calculated within each sample category (speargrass species and bulk sand). They were calculated for bacterial and fungal host-associated communities using the distance tree output from QIIME built including all bacterial and fungal SV, respectively , as well as abundance data in the R package picante . Because of the autocorrelation between Faith’s PD metric and richness (bacteria: adjusted r2 = 0.94, r confidential interval 0.96 to 0.98, p < 0.0001; fungi: adjusted r2 = 0.91, r confidential interval 0.92 to 0.97, p < 0.0001), the ratio PD/SV has been used to investigate the difference explained by phylogenetic diversity excluding the possible artefact due to abundance counts. NRI and NTI examined whether co-occurring taxa are closely related than expected by chance, providing information at deep-level relatedness and finer-scale of phylogeny, respectively . Positive values of NTI and NRI (> 0) indicate phylogenetic clustering (i.e., SVs within the host are more closely related than expected by chance), whereas negative values (< 0) indicate phylogenetic overdispersion (i.e., SVs within the host are less closely related than expected by chance; ). Estimation of phylogenetic turnover (ßNRI and ßNTI) has been conducted using the function ‘comdistnt’ in R with ‘picante’ package . βNRI values <− 2 indicate significantly less than expected phylogenetic turnover (homogeneous selection), whereas βNRI values > + 2 indicate significantly more than expected phylogenetic turnover (variable selection; ). Differences in mean phylogenetic alpha and beta diversities between the hosts were assessed with ANOVA, and post hoc pairwise comparisons (Newman-Keuls Multiple Comparison Test) were performed in GraphPad Prism 7 software. Kruskal-Wallis test (FDR p correction) was used to detect the difference among taxonomic groups in rhizosheath-root system compartments and species. Co-occurrence relationships were analysed for each plant species and bulk soil using the CoNet plugin of Cytoscape 3.4 and visualized using Gephi 0.9.1 . A combination of the Bray-Curtis (BC) and Kullback-Leiber (KLD) dissimilarity indices, along with the Pearson and Spearman correlation coefficients, were used to build the network. Edge-specific permutation and bootstrap score distributions with 1000 iterations were performed. The obtained data was normalized to detect statistically significant non-random events of co-occurrence (co-presence and mutual exclusion). The p value was computed by z-scoring the permuted null and bootstrap confidence interval using pooled variance . The most important statistical network descriptors were calculated . Node centralization descriptors such as degree, betweenness centrality, closeness centrality and average shortest path length were normalized using a standardization method (n1) for visualization purposes. The effect of compartment and plant species was assessed for the three main node centrality parameters: (i) generalized linear model with a quasi-binomial distribution of error was performed for betweenness centrality; (ii) ANOVA of log-transformed values was used for closeness centrality; (iii). ANOVA on normally distributed values was applied for the average path length. Hubs and keystone species were identified separately for each speargrass and bulk sand networks. Hubs were defined as those nodes within the top 5% of degree values in a network, while keystones were defined considering the top 1%. Ramona Marasco and María J. Mosqueira contributed equally to this work. The authors thank the staff of the Gobabeb Training and Research Centre for excellent assistance, fruitful discussions and in plant species identification, Sadaf Umer for her indispensable help in lab organization, Stelios Fodelianakis for help in the analysis of the phylogenetic diversity. This research received no specific grant from any funding agency in the public, commercial, or not-for-profit sectors and it was financially supported (baseline fund to DD) by King Abdullah University of Science and Technology (KAUST). JBR and DAC were supported by the South African National Research Foundation (grant number 95565). JBR was also supported by the Research Development Program (RDP) of the University of Pretoria. The datasets generated or analysed during the current study are available in the NCBI SRA repository under the BioProject ID PRJNA481151 (accession number SRP153940, bacteria dataset) and PRJNA481154 (accession number SRP153934, fungi dataset). RM and DD contributed to the conception of the study and the experimental design. RM, DD, JBR and GMK contributed to the sampling. RM, MM and MF performed the experiments, analysed and interpreted the data and wrote the manuscript. GMK contributed to the plant identification. JMB contributed to the scanning of electron microscope images. GM performed the quantitative PCR analysis. JBR performed the soil chemical analysis. JBR, DAC and DD contributed to the manuscript editing. All authors read and approved the final manuscript. Vigani G, Rolli E, Marasco R, Dell’Orto M, Michoud G, Soussi A, et al. Root bacterial endophytes confer drought resistance and enhance expression and activity of a vacuolar H + -pumping pyrophosphatase in pepper plants. Environ Microbiol. 2018;00. https://doi.org/10.1111/1462-2920.14272.